Robbie Neilson declared himself satisfied after late goals from Callum Paterson and Soufian El Hassnaoui got Hearts’ series of pre-season friendlies off to a winning start in Dublin last night. The Scottish Premiership new boys looked like they were going to be held to a goalless draw by a fired-up Bohemian side who are already half way through their League of Ireland campaign. However, a contentiously-awarded goal, scored by Paterson, and a last-gasp penalty from El Hassnaoui ensured some celebration for the 40 Hearts fans who made the journey to Dalymount Park, a dilapidated but endearing ground in the north of the Irish capital which resembles something from the old Eastern Bloc. As they did in their opening friendlies of last summer, Hearts, in a pre-planned move, changed their entire team at half-time. Among the starting XI were their three new recruits, Gavin Reilly, Juanma Delgado and Blazej Augustyn. In addition, Mergim Bajraktari, a 22-year-old Swiss-born Albanian player who has been training at Riccarton over the last few days, was pitched into a central midfield role as a trialist alongside Morgaro Gomis, who wore the captain’s armband. Neilson is still mulling over who to name as his new skipper following the departure of Danny Wilson, with Gomis, Alim Ozturk and Neil Alexander the leading contenders. Ozturk, still feeling his way back to fitness following a minor stomach operation at the end of last season, was the only one of the 24-man travelling party not to feature. Dale Carrick and goalkeeper Scott Gallacher didn’t make the journey across the Irish Sea. Within seconds of kick-off, the new front two of Juanma and Reilly almost made an instant impact when they played a one-two deep inside the Bohemian half, but the big Spaniard was closed down by right-back Ryan Hughes as he tried to get his shot away at the edge of the box. Alexander endured a difficult opening five minutes. First he was caught late by Bohs forward Aaron Ashe as he rushed to clear a short Jordan McGhee pass back. Then his routine pass to Liam Henderson ricocheted off Ashe, but, thankfully for the Hearts keeper, the ball spun over the open goal. Augustyn was catching the eye with his willingness to stride out of defence in possession and the big Pole, clearly not short of confidence, rasped a 25-yarder just wide in the 12th minute. After a lull in proceedings, Sam Nicholson tried to enliven things in the 25th minute when he unleashed a powerful goalbound strike from just outside the box, but Bohemian goalkeeper Lee Steacy threw himself to his left to make an excellent save. Five minutes later, Juanma almost broke his duck when he met an inviting Liam Smith cross from the right six yards out, but his header came back off the underside of the bar. The hosts threatened in the 40th minute when Robert Duggan found himself a yard of space inside the box, but his tame shot was easily clutched by Alexander. A minute later, the Tynecastle side went close with another strike from distance when Gary Oliver’s powerful drive flew just past Steacy’s right-hand post. Right on half-time, Augustyn nodded a Nicholson corner just wide. That was to be the last action of the night for he and the rest of the starting XI. On a night that was always primarily about fitness rather than performance, the Pole made a reasonably eye-catching first impression. Likewise Juanma, who showed some nice touches and offered a presence in the attacking third. 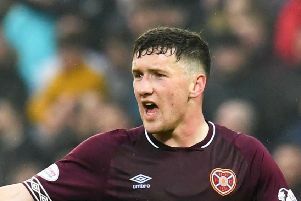 Reilly worked hard without getting a clear sniff of goal, while the involvement of the trialist, formerly of Stade Nyonnais, was notable only for a couple of interceptions and routine passes. Among those to enter the fray for the second half were Jahmal Howlett-Mundle, the recently recruited defender who is earmarked to play primarily in the development team this season, and Prince Buaben, who made his first appearance in more than four months after a broken toe sustained in February ruled him out for the closing two and a half months of last season. The former Dundee United midfield played at centre-back, an area Neilson is still hopeful of beefing up, and strolled through the second half against the fired-up but limited hosts. Hearts’ first chance of the second half fell to Kevin McHattie in 58 minutes but the left-back, sliding in at the back post, was only able to turn his effort into the sidenetting from a Paterson cross. After Bohs player Alan Murphy was booked for a bad tackle on El Hassnaoui, the hosts almost took the lead with eight minutes left when Craig Hayes saw a dangerous, dipping effort from 25 yards out tipped away by Jack Hamilton. But Hearts won it in contentious fashion with four minutes left when Paterson’s cross from the right was deemed to have dipped over the line, much to the anger of the home players who were adamant it shouldn’t have counted. “I couldn’t tell if it was in,” admitted Neilson. The visitors sealed their victory with the last kick of the game when El Hassnaoui, whose first season at Tynecastle was ravaged by injury, converted a penalty after Billy King was tripped. Bohemian: Steacy, Best, Caffrey, Creevy, Hughes, Dillon, O’Brien, Duggan, Kavanagh, Ashe, Hyland. Subs: Mahon, Lawless, Buckley, Murphy, Akinade, Wixted, Hayes. Hearts first-half team: Alexander, Smith, McGhee, Augustyn, Henderson, Nicholson, Gomis, Bajiktari, Oliver, Juanma, Reilly. Hearts second-half team: Hamilton, Paterson, McHattie, Buaben, Howlett-Mundle, Sow (Buchanan 74), Anderson, King, Pallardo, El Hassnaoui.